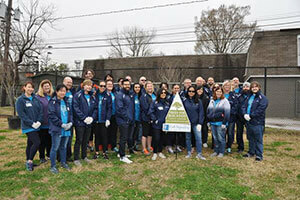 On February 8, 2018, Trees For Houston and Cell Signaling Technology employees planted trees at Thompson Elementary. While in Houston for the annual North American Sales Meeting, Cell Signaling Technology (CST) employees spent the afternoon at Thompson Elementary planting trees, located in Houston’s Third Ward near the Medical Center. The company sponsored the planting of numerous native trees, which will now provide shade and a green backdrop for students to enjoy. “Trees we plant today will benefit generations to come. It’s an added bonus to the work we do and why we appreciate Cell Signaling Technology for their partnership,” said Barry Ward, Executive Director, Trees For Houston. “As a private company, we are not driven by quarterly profits. In fact, our goals extend far beyond making money, which provides our employees the freedom to be creative in the workplace, and the ability to give back to the local communities. We specifically chose to host our annual sales meeting in Houston as a way of promoting local economic growth as this community continues to rebuild post Hurricane Harvey. A partnership with Trees for Houston aligns with our social and environmental goals,” said Michael J. Comb, Ph.D., Cell Signaling Technology President and CEO. Trees are well known for reducing air pollution, but they can also help minimize noise and light pollution, and reduce stress. Pollutants such as nitrogen oxide, carbon dioxide, and particles are associated with unsafe air quality, and an increase in respiratory and cardiovascular disease. Trees greatly enhance an urban environment, connecting people back to nature, which has been shown to influence and affect a person’s mood and mental well-being. Trees for Houston is a non-profit organization whose mission is to plant, protect and promote trees throughout the Houston area. Since being founded in 1983, the organization has planted over 500,000 trees planted and has maintained tens of thousands of trees across the greater Houston area annually.